Home / Chemicals in the Water / HOW MUCH WATER SHOULD AN ADULT DRINK PER DAY? There are many different opinions about how much water one should drink daily. The health authorities generally recommend eight 8-ounce glasses (64 oz.) a day, while other water experts say that one should sip water throughout the day (even when you’re not thirsty) to avoid dehydration. Maintaining water balance is essential for our health and survival. Even though the body is made up of about 60% water, the average adult loses two to three liters of water a day through natural bodily functions, primarily through sweat and urine. The answer to this question then, depends on the individual and their particular situation. For example, if you’re an athlete or runner, it’s likely you’re going to need to take in more fluids than someone who works at a desk all day. If your line of work entails public speaking, studies have shown that it is actually more dehydrating than running! If you’re a nursing mother, The Institute of Medicine suggests that the amount of fluids typically consumed by breastfeeding mothers is 3.1 liters, compared to the approximate 2 liters suggested for a regular adult. The environment and weather will also affect our ideal water intake. Do we live in the tropics, the dry desert, or the wetlands? There are so many factors that will ultimately affect our need for water. What most people forget to consider when asking the question, “How much water should I drink?” is “How much clean and purified water should I drink?” In other words, is our water safe to drink in the first place? What most authorities are missing when they answer this question are the facts about where one’s water is coming from and the importance of drinking clean water. Should one drink straight tap, bottled, or chemically treated water if they don’t know what’s in it? 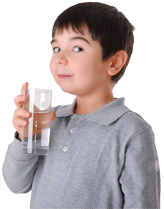 If our water contains fluoride, chlorine, and/or chloramine, should we still be drinking sixty-four ounces of it a day? Of course not. If studies have shown that drinking chlorinated water can increase one’s chance of getting cancer, should we be recommending that people drink more and more of this water per day? Probably not a good idea. Drink clean water…and then address whether you’re drinking enough of it.